Hayes taking over. He's got 9 points, heading back to the line. #Badgers up 22-13 with 8:44 left. Devin Robinson has 2 fouls for Florida. Except for those free throws, I guess. 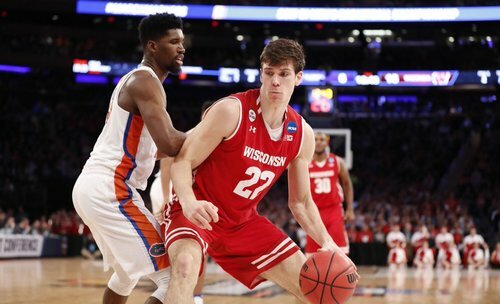 Hayes with 9 and the #Badgers lead 24-13 with 7:49 left in first half. UW has seven assists on 10 field goals. Hayes has 9 pts and #Badgers , with 7 assists on 10 hoops, has a 24-13 lead with 7:49 left in half. Wisconsin 10-for-16 from the field. Florida only 6-for-19. Gators with no points in the last 2:30. 24-13 Badgers. Hayes with 9 points. Bucky lays waste to Albert the Alligator in the dance-off. 10-7 round. Guessing Gators didn't expect Nigel Hayes to hit four long jump shots. #Badgers lead 24-13. Wisconsin with only three turnovers in 19 possessions. No points off turnovers for the Gators. Pritzl takes the charge. That's two on Stone. Stone picks up his 2nd foul after Brevin Pritzl takes a charge. #Badgers Pritzl can't hit an open 3 but he takes a charge. I think March 2016 Vitto Brown is back. Corner three from Vitto to put the Badgers up 9 with 5:30 left in the first half. Pritzl wreaking havoc on defense. And #Badgers Pritzl just forced another TO. Pritzl draws another charge. Two in the last two minutes. Hayes picks up his second foul with 4:25 left. Both came on offensive end of the court. Second foul for Hayes at 4:25. He'll sit with nine points. UW leading 27-20. Timeout on the floor. 27-20 UW with 3:53 left in the half. Trice on the floor with two fouls. Hayes sitting with two fouls. #Badgers up 27-20 with 3:53 left in first half. UW has one field goal in its last 7 possessions -- a Brown 3-pointer -- with 4 TOs. #Badgersd have a 27-20 lead but FLA ball OB and Hayes is on bench with 2 fouls. Seven turnovers in 25 possessions for the #Badgers . 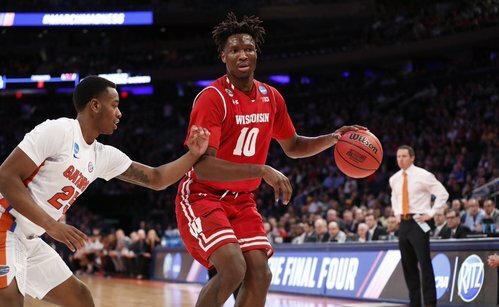 Nigel Hayes with 9 points, but 2 personal fouls. #Badgers trying to shake the turnover bug with 5 TOs last 4:16. Shooting has cooled a bit too. Hayes with two fouls should keep him on the bench. Showalter has been leaning in for the past few drives. Got caught. Brown (10 points) the first player to reach double figures. Nice look from Vitto down low to find Iverson who picks up the foul. Gators jacking up the pressure now. #Badgers need to slow down on offense.